ok i know the subject has been gone over alot and asked alot, i have searched and it really hasnt help to much. so i have a few questions, i know you can put the 280zx hubs,spindels and struts on a 510 front end but what has to be modified to do so? i read in here of people cutting them and shortening them. i just need to know what all needs to be done to get them to fit a 510. Unbolt complete front strut/hub/brakes from 280zx, bolt into datsun 510, AFAIK. All mounts/bolts are same pattern. Use ZX brake lines? Shortening struts is for going maor lowar. The 280zx spring is too big for the 510. spring, perch, and top hat must be removed and replaced with a 510 perch, spring, top hat OR adjustable coilovers. I say go with the coilovers. You don't HAVE to shorten the struts, they are a little shorter than stock 510 struts already. use stock or zx brake lines, and I highly suggest new master cyl. from a 280z if you are keeping stock rear brakes or a 280 zx master if your doing rear discs too. So the ZX strut bolts the same to the steering arm? Lower mounting points are the same 280zx / 510. the struts don't bolt to the steering arm at all, the lower ball joint that the strut mounts to is attached to the steering. the whole strut turns when the car steers. When I did it, I reversed mine(L to R, R to L). Otherwise the caliper has clearance issues. They bolt right in, but as was mentioned, the springs are too large. You have to either go with coilovers or weld the 510 spring perch onto the ZX strut. I recently did this. You can switch the struts like Micro is saying. It will make it easier to change pads in the future, but its not impossible. I did mine the uber cheap way, and without a welder. Here is the 510 strut, you need the lower spring perch off of it (try looking thing). You also need to remove the lower spring perch from the ZX struts. I then used my grinder to make it smooth. To hold up the 510 spring perch on the ZX strut, I am using these "collars", 2 inch ID. Use the 510 top suspension parts. You can trim the ZX top plate to fit in the 510, I hear this gives a little more drop. I did not switch my struts, and therefore calipers. I also used my stock 510 brake lines. Once I got into it, everything was straight forward. thanks for all the info and help this forum is amazing! Good info... I didn't know this. Why are coilovers the best way? You already have the 510 springs and perch right there. Collars are only $25 x2, coilovers are over $200 set??? Or do you mean best for lowering? My Friend Vince installed ZX struts in his 510 with the ZX springs and perches. He had to trim the inside of the strut tower at the bottom to make clearance for the wider springs. He also trimmed the ZX top hat to reduce the diameter so it could fit in the 510 strut tower. He cut one coil from the springs and the ride height was nice. The car felt good with the ZX springs on it. I have coilovers on my ZX struts and I did the no weld method with the shaft collars. If you can use the larger diameter zx springs there is little room for camber adjustment inside the strut tower. A narrower spring is better. 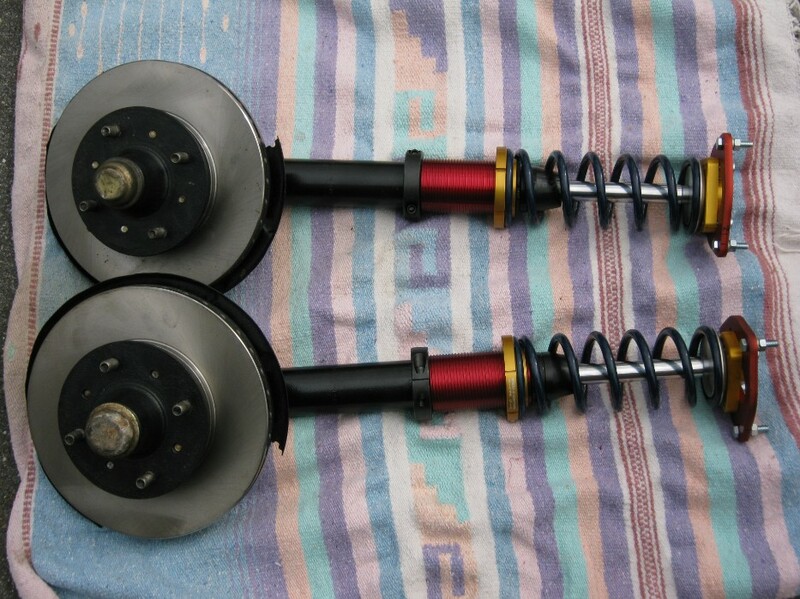 As for adjustable coil overs they are great for racing or if constantly changing tire or spring sizes or rates but otherwise you are spending a lot of money on something you adjust once and forget about. While the spring is off your strut you might consider replacing the factory strut hydraulic fluid with something 'thicker'. The fluid in my Maxima struts was thin (probably 5W) as water and I replaced with 20W motorcycle fork oil. The thicker oil much inproved the damping action. Fork oil comes in a variety of viscosities for tuning bike suspension performance. I trimmed my 710 springs and fit them on Maxima struts that were an inch and a half shorter and replaced the oil. My calculations show a spring rate of about 150 (up from stock 110) when shortened. Love them. I fully agree. I was only letting people know that it has been done and works well. As to camber, you can use adj. control arms if you need to. I only did the coilovers cause I got them cheap ($100 for the set on fleabay) My other 510 has stock 510 struts that have been cut down and the lower spring perch is adjustable with a shaft collar. How are the LCAs adjustable? My camber plate is hard over and I don't think it's right yet. He did not say to adjust the LCA. He said use adjustable LCA's. Good! Hate to think is missed adjusting it. Hmmm I have a second set of LCAs....maybe skip the Heim joint and weld something up. Adjusting the strut outward would also throw the tension rod out too wouldn't it?? Ha ha the cure is worse than the disease. So I have a question roughly about this topic, as good a place as any to ask it. looking at replacement struts for the 210, from pictures it seems like its a cartrige that fits into a socket in the hub. what holds these in? didnt see a pinch bolt or anything. thinking about just replacing these and making them into coilovers. the "cartrige" part is the shock, the strut assembly is the thing that holds the shock inside it, has a big nut at the top that holds the shock in. I've got a question for you guys as I'm planning on doing this swap... 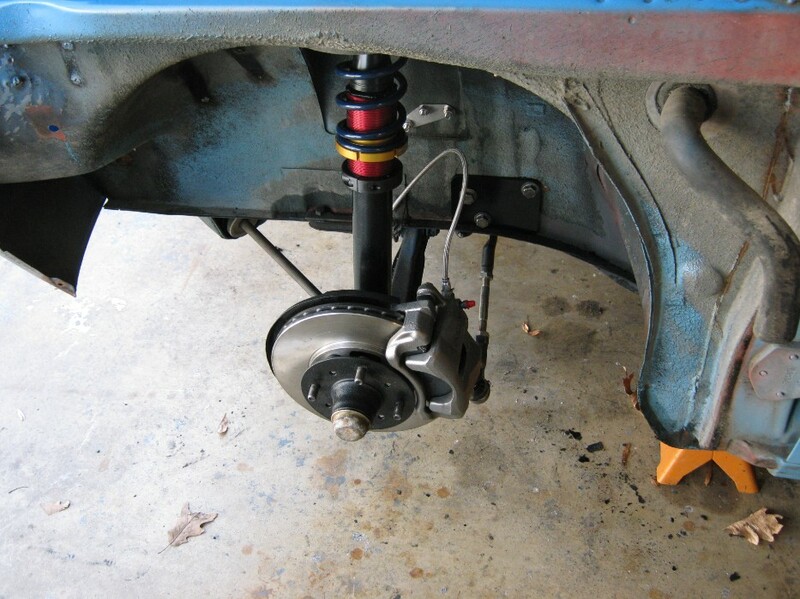 I was reading Dave Coleman's rally beater 510 build (it's on Modified Magazine's web archive now), and he said when the 280zx struts and brakes are swapped on, the pads wear down the calipers slide in and they hit the outer tie rod. His solution to the problem is to keep an eye on the pads and keep running fresh ones. I don't think I've ever seen anybody else mention this in my researching. Anybody experience this? The real solution to this is to run RCA's (roll center adjuster) or Bump steer spacers. I recommend using these if you run ZX Struts and lower it at all. This will help with the darty front end. Okay I see. the strut cartridge slips into the tube and then is held in with what? snap ring or bent over metal tabs? Seen these before on cars just never changed just the cartridges. Next question, any other cartriges fit in these besides 210 specific ones? about to order cartridges and was wondering if any other datsun/nissan ones fit and are an upgrade. Id do 280zx stuff but am having a real hard time finding em so im just gonna put new cartridges in for now.